When I think pepper the first thing that comes to mind is salt. I asked Jon Melamut, VP of sales & business development for Pepper where they got their name from as my first question. “Peppers are hotter than apples”, he replied with a joking smile. Jon admitted immediately that he was an Apple lover, but couldn’t resist when I set him up so good. “Pepper is just an easy name to remember, it sticks” he then told me with a bit more sincerity. Pepper’s aim is to make something that’s easy, simple, and fun, their name definitely reflects that. What is the Pepper Pad? In this gadget geek’s opinion, it’s somewhere in that middle haze between laptops and PDA’s. The Pad is designed for recreational use only, this is not a work related device! 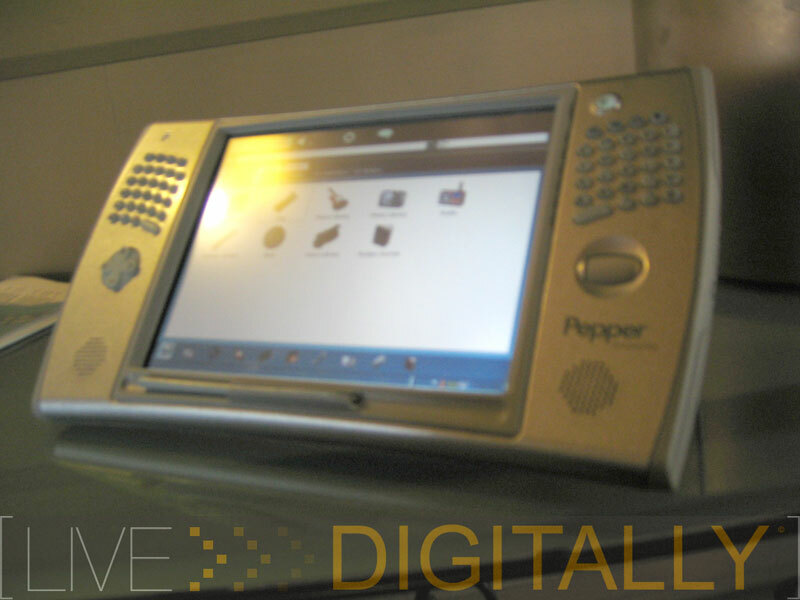 AIM, email, internet browsing, and digital media are the focuses that Pepper put into it’s Pad. Linux runs this bad boy, which keeps viruses and spyware to a minimum yet stability at a maximum. The browser is powered by the Gecko engine, which not coincidentally powers our favorite friend Mozilla’s Firefox. POP3, IMAP4, and AOL mail can be accessed on these 2 lbs of fun. The screen is a touch screen and the icons are very self explanatory. Tabs are incorporated into each app making it easy to switch between areas of a program. Bluetooth, WiFi, USB 1.1, and SD/MMC expansion card slots are built in to Pepper. It can act as a remote control for pretty much everything but the kitchen sink (unless you have a IR port on your sink, which I would actually like to see for kicks). That’s the functionality of this pad, but what are the specs? First thing I inquired on was the power, how long will my battery last on this pad: 3-4 hrs depending on your screen brightness setting. I would have liked a bit longer considering that there’s an Intel XScale PXA270 processor which clocks in at 624MHz. 256MB SDRAM, 16MB ROM, 16MB Video RAM and a 20GB hard drive. 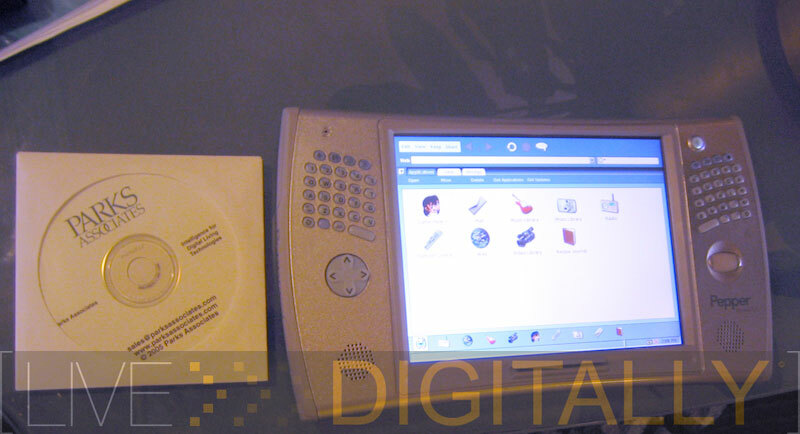 The 8.4” touch screen boasts an 800×600 resolution. Pepper has included support for media in a way that doesn’t force you to organize, sort, and search in a windows like environment. Download a song and that song is auto stored in the music folder. Add a video via your USB jump drive and that video is filed away with your video collection. The customization factor is minimal for this device, which in tradeoff makes this very user friendly. I can see the Pepper Pad replacing many home computers in the near future. Most professionals have a work issued laptop and require only the basic email, internet, and digital media from their home computer. 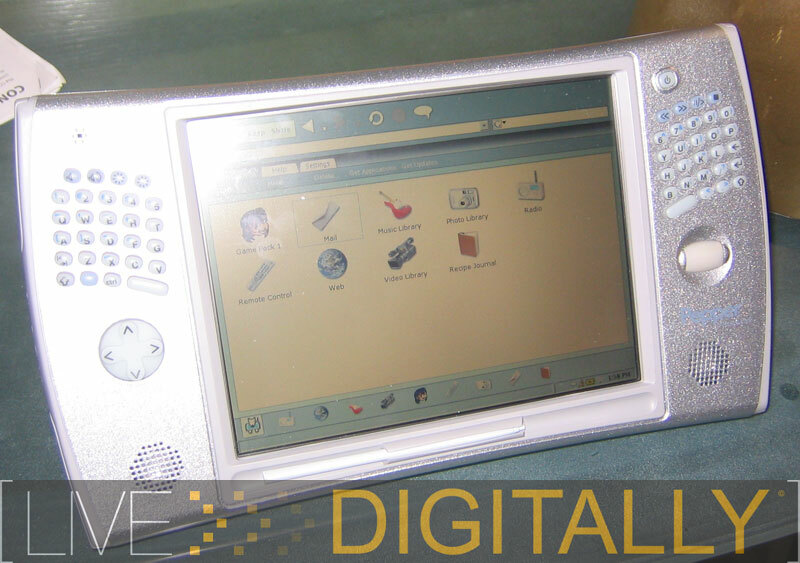 MSRP of $850.00 makes this a very attractive home computer substitute, or a really large and expensive PDA.